We still do not know for certain: Who shot JFK? Was their a conspiracy, and no lone gunman? Who did the 'Jack the Ripper' murders? Who wrote the 'Shake-speare' plays? Did Richard II murder the Princes in the Tower? Did Jesus marry and survive the Crucifixion? What are the ancient mysteries of the Great Pyramid and the Sphinx? Was the man calling himself Rudolf Hess and who landed in Scotland in the Second World War really Hitler's Deputy, or a deceptive double? 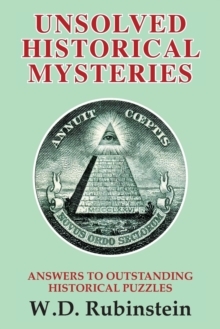 Here, a leading historian asks questions, explores possible answers, and presents a fresh view of these great and unresolved mysteries.This is a fascinating and objective series of enquiries. The distinguished author evaluates what evidence exists, and the many and varied theories offered on each unsolved but nagging mystery.The book goes behind the scenes to examine much that remains in the shadows. He enquires about clandestine intrigues, whitewashed evidence, fraudulent claims, and much that many academic historians have previously ignored.Professor Rubinstein reaches some quite unexpected conclusions.